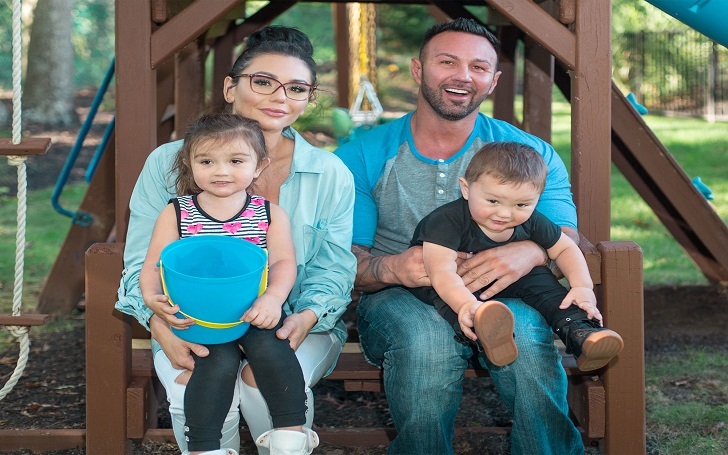 It's been six months since Jenni 'JWoww' Farley filed for divorce from her husband Roger Mathews and the estranged couple has now reunited for an easter train ride with their children. The Jersey Shore star, 33, took to Instagram Stories on Saturday, April 6, and shared videos of a train ride. In one video, their son Greyson, 2, and daughter Meilani, 4, compared plastic Easter eggs as the businessman, 43, sat at a table looking at his phone. In a second video clip, JWoww cuddled up next to Meilani and smiled sweetly. She and Roger sat across from each other at a table at one point. As we previously reported, JWoww filed for divorce from Roger, ending their marriage of nearly three years. They have been involved in multiple legal battles ever since. The MTV star filed the divorce papers asking to dismiss her husband's divorce petition in February. Both of the parents requested joint legal physical custody of the kids. The pair met on Jersey Shore show and eventually started dating. They tied the knot on October 18, 2015. JWoww was previously in a relationship with ex-boyfriend Tom Lippolis, with who she starred on the MTV hit series.